This insulting headline means only one thing: central bankers have started waging a war against savers. “If central banks did not do this, investing would be unattractive,” added Draghi. In other words, shut up and buy some stocks! What those central bankers want you to do is either (1) spend money to increase demand, or (2) buy stocks to increase capital. Well, it sure looks like American consumers are not doing the former. Experts say that the US economy is consumer driven. It’s true; consumer spending makes up 70% of our GDP. 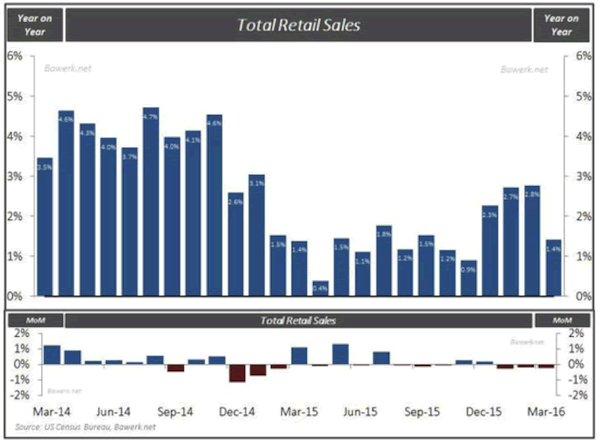 The latest data shows, however, that retail sales fell over the entire first quarter. If Smith and the Census Bureau are right, our economy is headed for a recession. 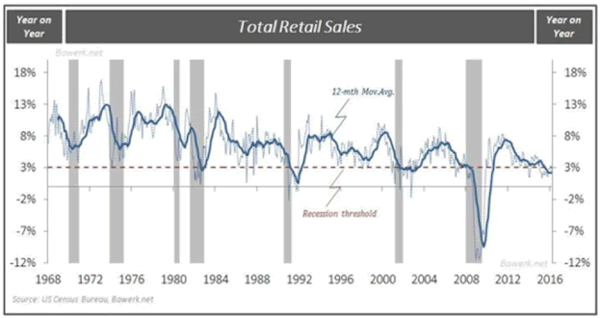 EVERY time the yearly growth rate of retail sales has fallen below 3%, the US economy has gone into recession. Worse yet, the SEC is planning a change that will add more fuel to the fire. The Securities and Exchange Commission has finally decided to put an end to the accounting hanky-panky that artificially inflates profits. It looks like the SEC is waking up to the misleading picture that pro forma earnings—compared to generally accepted accounting principles, or GAAP—generate. Now, the commission is launching a campaign to crack down on made-to-order earnings. 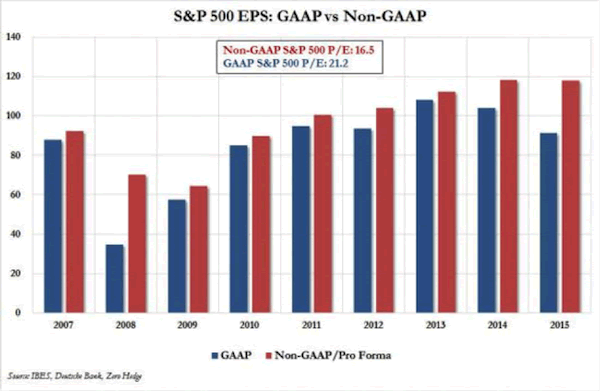 To see the impact of such a crackdown, all you have to do is take a look at the growing difference between GAAP profits and pro forma profits. By the way, I suggest you reread my March 8, 2016 column about corporate America’s accounting razzle-dazzle. Yes, my bear market radar is on high alert, and the new SEC scrutiny could be just the thing that knocks the bull market off its feet.